Last Saturday, a few friends and I had the chance to check out Taco Day at Expressionz Cafe. We had originally heard about these delicious tasting tacos from one of my friends. She had noted how delicious they were and that we had to try it out as they reminded her of the food from home. Taco Day happens every other week at Expressionz Cafe and you can find the exact schedule on their website. In fact, the next Taco Day is this coming Saturday April 5! 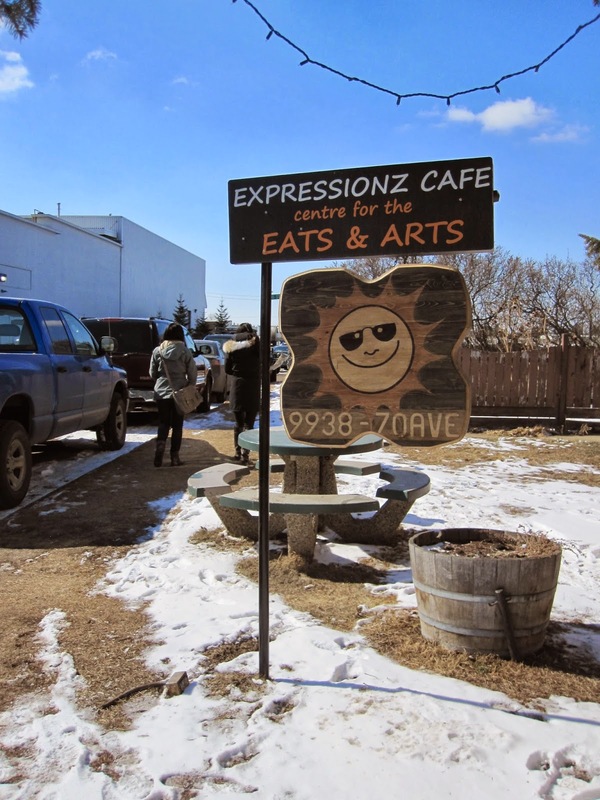 Expressionz Cafe is located close to the Real Canadian Wholesale Club off of 99st on 70th ave. Parking can get tight, so parking might get inventive. We arrived around 1pm and found a table for 4 fairly quickly. The place was busy, and everyone looked super happy either enjoying their meal or snacking on the chips that arrived to the table while waiting for their meal. 3 different sauces that arrived with the chips - all were tasty, fresh and went well with the tacos. In the end we decided to order two orders of the Las Carnitas, one order of El Pastor and one order of the El Suadero for four people. Pictured above are all three types. Upon receiving the tacos we quickly squeezed the fresh lime/lemon on the tacos and ensured that everyone had 2 Las Carnitas and one each of the El Pastor and El Suadero. This was truly genuine Mexican street food. The softness of the tacos, the balance of the flavours and acidity was amazing. For those of you that know me, I am not a fan of cilantro and I can tell you that the flavours were done so well, that I hardly noticed that the cilantro was there! The corn tortillas were soft and warm as well. Needless to say we were super full after eating our own 4 tacos each (16 tacos in total). The overall consensus for favourites was the Las Carnitas tacos with the pulled apart braised Alberta pork shoulder. Everyone had their favourite between the El Pastor (pork) and El Suadero (beef). My husband really liked the El Pastor made with the chopped slow cooked pork, special red spices and the touch of pineapples. He felt that the flavours all balanced well. Our first taste at Expressionz Cafe was not only tasty but delicious! In terms of pricing, each order of 4 tacos is $10. Great price, considering you can actually choose two flavours that you want or one of each kind. I will definitely be back for Taco Day! When leaving, they also mentioned that they have Fondita Days which is Mexican comfort and street food (every other Thursday) from 5-9pm. Sound really intriguing and we will certainly return to try their cuisine for supper.